A place of education and living for children who are deaf, blind, or have learning challenges. 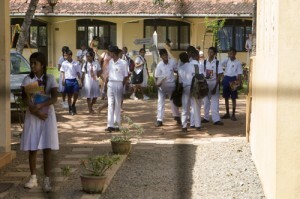 Students heading home at the end of the school day. Just a few years ago, Rohana Special School wasn’t such a special place; teachers were untrained and facilities were dirty and poorly maintained. Now, with the support of contributors and volunteers, our school is now a shining star for children with disabilities living in Sri Lanka. Special training by experienced teachers of the deaf from the U.K. Your support is still needed! We have a long way to go before Rohana Special School truly becomes the best special school in Sri Lanka. Donations of all types–time, money, materials, love–are happily received. Please go to the Contact Us page to let us know what you have in mind.